In recent decades, we have seen impressive population growth in metropolitan areas all over the globe. Both an increasing world population and strong migration from rural to urban areas have led to a stronger growth than ever. Cities are struggling with the consequences of their success: urban infrastructure is under pressure and planning issues have become more and more complex. It requires urban planning practices to be re-invented, states Professor Karin Pfeffer, who held her inaugural lecture as professor in Infrastructuring Urban Futures on Thursday 14 June. A multi-, inter- and transdisciplinary research approach can shift our current understanding of the mutual relationship between urban development, infrastructures, services and people. It can inspire urban planners and professionals, but also citizens, to re-invent or re-organize their practices. “This shift in perspective is very much needed to reach the ambitions set out in Sustainable Development Goal 11 and the New Urban Agenda in securing access to urban infrastructures“, says Karin Pfeffer. Building upon a firm and broad knowledge base, different strategies may help coming up with viable and sustainable solutions. By triggering creativity, prototyping within an urban living lab setting and new forms of co-creation, for example. “By appropriating a broad, integrated approach - bringing together different knowers and knowledge types, disciplines, actors, methods and tools - we will be able to get to know the city even better and will be empowered to infrastructure more equitable and sustainable futures”, says Karin Pfeffer. 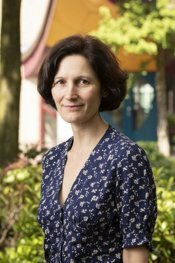 Professor Karin Pfeffer obtained her PhD in Physical Geography at Utrecht University in 2003. Since, she has held various positions in the field of geography and planning at the University of Amsterdam. For Karin, it is a renewed introduction to ITC, as she has been working at ITC as a lecturer and researcher in 2004-2005.